The reconstruction of Lakeshore Road in downtown Oakville is scheduled to begin this spring and will be completed in two phases over a two-year period. In advance of the reconstruction, Union Gas will be installing a new gas line on each side of Lakeshore Road. Lakeshore Road will be closed to vehicles from Navy Street to Dunn Street from April 15 to November 15, 2019 for the first phase of the Lakeshore Road Reconstruction and Streetscape Project. Church Street and Robinson Street are alternate routes during construction. Union Gas work is completed. Lakeshore Road between George Street and Dunn Street is closed to vehicular traffic while Union Gas continues the gas line installations on each side of Lakeshore Road. Dunn Street from Lakeshore Road to Robinson Street will be closed to through traffic on Monday, April 15, 2019 and reopened on Thursday, April 18, 2019. Dunn Street from Lakeshore Road to Church Street will be closed to through traffic on Thursday, April 18, 2019 and reopened on Wednesday, April 24, 2019. Union Gas will not be working on Friday, April 19, but will be working on Monday, April 22, 2019. All Union Gas work will be completed by Thursday, April 25, 2019. Union Gas contractor will continue removing sections of sidewalk and digging the trenches with a hydrovac truck. The trench is covered with heavy plywood or steel plates until the gas line is installed and backfilled with granular material. The sidewalk will be temporarily restored with asphalt. Pedestrians are directed around the work zones with fences and barricades. The contractor has ambassadors on site dedicated to guiding pedestrians through the work zone. The work area will be noisy from the hydrovac truck and trench compaction equipment. During the Lakeshore Road reconstruction, Council has approved a parking program to help attract customers and visitors to downtown Oakville. Use the promo code DOWNTOWN in the Honk Mobile app to get your first hour of parking free at a metered space or in a municipal parking lot in downtown Oakville. Parking at a metered space or in a municipal parking lot has always been free on Sundays and holidays. During the reconstruction, parking at a metered space or in a municipal parking lot will also be free on Saturdays. The former fire station lot at the corner of Randall Street and Navy Street will be converted into a temporary parking lot to provide more parking options for visitors, customers and employees in downtown Oakville. When Lakeshore Road is closed for construction, the side streets in the immediate blocks become temporary dead end streets. These streets will be converted to create more parking spaces by providing perpendicular parking along one side of the street. This will create more parking spaces for convenient access to the stores, restaurants and businesses near the road closure. Parking will continue to be provided for visitors, customers and employees throughout downtown Oakville during the Lakeshore Road reconstruction project. Parking at the on-street metered spaces and in the municipal parking lots is free after 6 p.m. and all day on Sundays and holidays. With the free Honk Mobile app, you can easily search, pay for and top up parking from a phone, tablet or computer. This payment option is easy and quick to use so you can get to where you want to go! How do I get the free first hour of parking? Use the Honk Mobile app and enter promo code DOWNTOWN to get your first hour of parking free at a metered space or in a municipal parking lot in downtown Oakville. This promotion is not available at the Church Street parkade or at the 20-minute quick stop meters. Can I still pay for parking at the meter? You can make payment at the meter, however the free first hour is only available through the Honk Mobile app. If I forget to use the Honk promo code, can I get a credit for next time I visit downtown Oakville? The first hour free promotion is available at the time of purchase only. A credit cannot be provided. Where can I park for free on Saturdays? During the Lakeshore Road reconstruction project, parking is free on Saturdays at metered spaces and in municipal parking lots in downtown Oakville. This promotion is not available at the Church Street parkade. If I forgot that parking was free on Saturday and paid at the meter, can I get a refund or credit? The free Saturday parking is only available at the time you park. Refunds and credits are not provided. Can I park all day on a Saturday without paying? Parking restrictions detailing how long you can park are posted on the meters or lot signs. All-day parking is limited to certain locations and lots. Visit the the parking page for more details. How do these parking programs affect my monthly-prepaid parking permit? The monthly-prepaid parking permits will continue during the Lakeshore Road reconstruction project. Employees of the downtown businesses should continue to leave the closest and most convenient parking spaces available for their customers and clients. Will there be parking enforcement in downtown Oakville during the reconstruction project? Parking regulations will continue to be enforced in downtown Oakville. 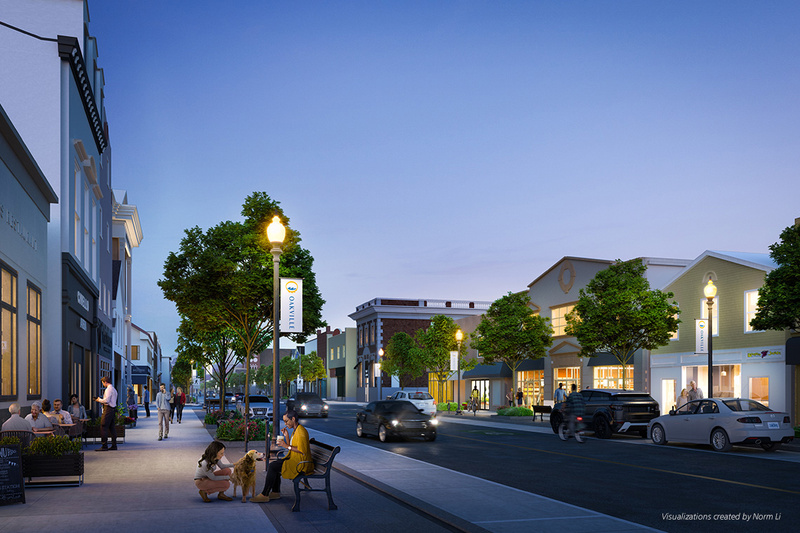 In September 2018, Oakville Town Council endorsed the Downtown Mitigation Strategy, which aims to soften the impact of the Lakeshore Road reconstruction on the business district in the downtown. The report is based on the findings and interviews with other municipalities that recently underwent similar construction projects as well as interviews with our own residents, Downtown Oakville BIA, businesses and other municipal stakeholders. It includes economic measures to minimize the impact of construction on business and targeted programs to bolster their operations, including Honk Mobile app and Digital Main Street programs. The marketing and communications plan is designed to keep businesses, residents and visitors informed through the opening of the Project Office in the district, and temporary wayfinding signs and displays. The Project Office, located in the former Post Office at 193 Church Street, is open Monday to Friday from 8:30 a.m. to noon and by appointment. This location is 'information central' for the reconstruction of Lakeshore Road. Staff are on-hand, ready to provide information and answer any questions. Using the promo code DOWNTOWN in the Honk Mobile app, the first hour of parking will be free anytime between 9 a.m. and 6 p.m. on weekdays. This initiative will be available for customers, visitors and residents who use the app in downtown Oakville during the Lakeshore reconstruction project. The Digital Transformation Grant provides $2,500 to each qualifying business to purchase and adopt digital tools and technologies. There are only 2,000 one-time grants, apply now on the Digital Main Street website. As part of the project, smart city technologies will be implemented. These innovative solutions offer long-term benefits for the commercial district, including public Wi-Fi, electronic information kiosks, people and car counters and electric vehicle charging stations. Trees are being removed as part of the Lakeshore Road Reconstruction project but will be replaced using a best practice technique called silva cells to ensure replacement trees are healthy and long lasting. A silva cell is a modular building block for containing unlimited amounts of healthy soil beneath paving while supporting traffic loads and accommodating surrounding utilities. The silva cells are filled with high quality uncompacted soil to grow trees to maturity, allowing the tree roots to grow laterally and offers a much larger area for growth. This will help the trees to grow to maturity and eliminate the constant 7-10 year rotation that has been occurring on many of the street trees in the downtown area. Can the trees be transplanted? An extensive arborist study on these trees was completed in August 2018. These trees are not good candidates for transplanting because their shape and growth indicate that they are stressed.The overall condition of the trees range between fair and poor. Some signs of decline and defects have been attributed to their restricted root environment. Their ‘girdling’ roots have grown around the base of the tree, due to the inability to extend outwards. As well, the trees are planted in among a number of utilities, electrical vaults making the transplanting process extremely difficult. The removal of the trees has been scheduled for a ‘dormant’ period for the bird population to minimize any impact on the bird population. Public meetings were held on March 1 and June 15, 2016 to get feedback on contemporary design palettes. Comments were also collected online from February 24 to April 1, 2016. Staff began incorporating the garbage/recycling stations as well as the granite pavers and curbs into the streetscape design as presented to the public this past March and June and approved by Council in July 2016. In September 2016, the town held a number of public engagement opportunities to find out what style of streetscape furniture — traditional, contemporary or classic — residents and businesses would like to see used in downtown Oakville. Each style was designed to complement the downtown heritage district. On October 3, 2016, Council approved a traditional furniture style for downtown Oakville. Review the staff report. Between December 5 and 23, 2016, the town went out for public consultation about what specific furniture pieces, lighting temperature, and bridge railing residents and businesses liked best for Downtown Oakville. The town provided two options for each piece of streetscape furniture; two types of lighting (LED fixture/bulbs), and three bridge railing options. Two choices of furnishing colour that supported a traditional theme - graphite and moss green - were also provided. Following extensive public consultation through the Downtown Transportation and Streetscape Study (DTS), a contemporary theme was chosen in 2015 over traditional and classical, to complement the historic buildings in the streetscape yet remain a reflection of the current time. Desire to maximize a flexible (curbless) design of the Lakeshore Road East configuration was also discussed at these meetings as a topic for consideration. Union Gas work was completed. Lakeshore Road between Thomas Street and George Street was reopened to vehicular traffic on Monday, April 8. George Street between Lakeshore Road and Church Street was reopened to vehicular traffic on Monday, April 8. Lakeshore Road between George Street and Dunn Street was closed to vehicular traffic while Union Gas continued the gas line installations on each side of Lakeshore Road. Lakeshore Road between Thomas Street and George Street was closed to vehicular traffic while Union Gas continued the gas line installations on each side of Lakeshore Road. Thomas Street from Lakeshore Road to Robinson Street was reopened to vehicular traffic. Thomas Street from Lakeshore Road to Church Street was closed to through traffic and reopened Monday, April 1. Union Gas completed the gas line installations on each side of Lakeshore Road between Navy Street and Thomas Street on Monday, March 25, 2019. Union Gas planned to work on Saturday, March 23, 2019 from 9 a.m. to 5 p.m.
Lakeshore Road between Navy Street and Thomas Street was reopened to vehicular traffic on Monday, March 25. Lakeshore Road between Thomas Street and George Street was closed to vehicular traffic on Monday, March 25, for approximately two weeks. Union Gas continued the gas line installations on each side of Lakeshore Road. Thomas Street from Lakeshore Road to Robinson Street was closed to through traffic on Monday, March 25, and reopened on Thursday, March 28. Local access to driveways was maintained. Thomas Street from Lakeshore Road to Church Street was closed to through traffic on Thursday, March 28, and reopened on Monday, April 1. Local access to driveways was maintained. Lakeshore Road between George Street and Dunn Street and George Street between Lakeshore Road and Church Street was closed to vehicular traffic on Monday, March 25, for tree removals on Lakeshore Road. When the tree removals were completed for the entire block, Lakeshore Road between George Street and Dunn Street and George Street between Lakeshore Road and Church Street was reopened. The reopening for vehicular traffic was scheduled for Wednesday, March 27. Union Gas continued installing a gas line on each side of Lakeshore Road between Navy Street and Thomas Street. Lakeshore Road between Navy Street and Thomas Street remained closed to vehicular traffic, but open to pedestrians. Union Gas had ambassadors dedicated to assisting pedestrians through the work zone. Tree removals on Lakeshore Road between Navy Street and Thomas Street began Monday, March 18 and were completed by Friday, March 22. The gas line across Navy Street south of Lakeshore Road was completed Monday, March 18 and Navy Street between Lakeshore Road and Robinson Street was reopened to vehicular traffic. Navy Street between Lakeshore Road and Church Street was closed Monday, March 18 to install the gas line across Navy Street north of Lakeshore Road. The gas line across Navy Street north of Lakeshore Road was completed on Thursday, March 21 and Navy Street between Lakeshore Road and Church Street was reopened to vehicular traffic. Union Gas started construction on Tuesday, March 12. Lakeshore Road between Navy Street and Thomas Street and Navy Street was closed between Lakeshore Road and Robinson Street on March 12. Public Information Sessions were held on Thursday, March 14 at the Project Office in the morning, afternoon and evening. 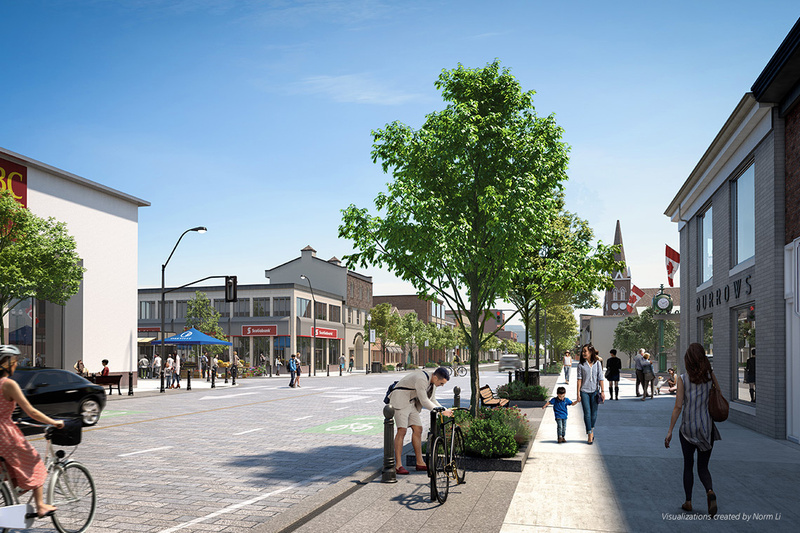 With Lakeshore Road East coming to the end of its lifespan and needing a major reconstruction, the town undertook extensive research and public consultation to identify broader opportunities to improve traffic, beautify streets and improve pedestrian/cycle ways in the downtown. In April 2018, Council approved the final design for the Lakeshore Road Reconstruction and Streetscape Project. Reconstruction will be done in two phases: Phase 1 in 2019 (spring to fall) between Navy and Dunn streets, and phase 2 in 2020 (spring to fall) between Dunn and Allan streets. The Downtown Transportation and Streetscape Study (DTS) was approved by Council in April 2015 which includes the Lakeshore Bridge Rehabilitation, the Two-Way Street Conversion, and the Lakeshore Road Reconstruction and Streetscape Project. The DTS is part of the overall Downtown Plan. Check out the virtual tour and photos below of the proposed streetscape design. *Images based on design presented at Public Meeting December 7, 2017 and are subject to change. Follow us on Twitter and Facebook for regular project updates, photos and more!